GOTHIC NECKLACES : BRITISH Made : LOVE2HAVE in the UK! The BEST! British Gothic necklaces and pendants all handmade in the UK at prices you can afford! On this page, you will find a handpicked collection of Gothic style necklaces and pendants that are also featured elsewhere in the men's jewellery and women's jewellery categories on this site. We have collated them together in one convenient section as the pieces suit both men and women. Everything here is made by hand in the UK and therefore oozes original designer quality and uniqueness. Many of the jewellery items listed are available with matching earrings or bracelets including the fun skeleton necklace amongst others. You will find these in the Gothic earrings section and the Gothic bracelets section also. 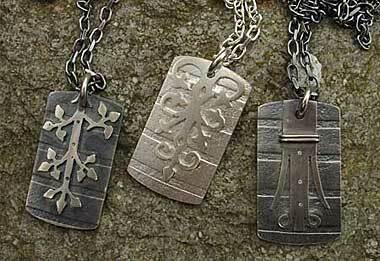 Prefer a non-leather version of one of our leather and silver Gothic necklaces?